Money trees are actually water chestnut trees made into Bonsaian, evergreen with lovely bright green foliage, extraordinarily hardy and traditional symbols of good luck, all of which makes them a perfect gift for others or a gift to yourself if you need a little extra positive karma. Our Single braided Money Tree is actually 5 individual trees that come together to form this incredibly unique specimen. 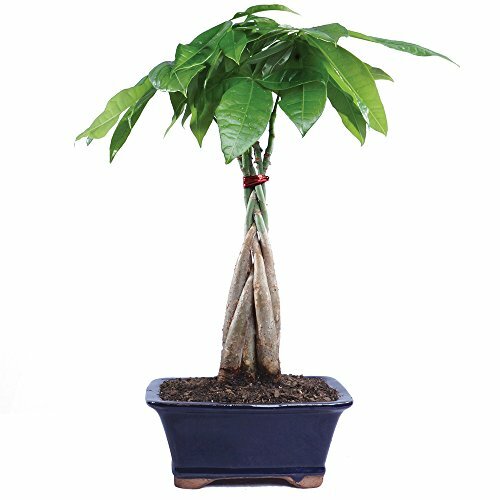 Money Trees are a great Bonsai for beginners or for anyone that could use a dose of happiness, health and wealth. SPECIES: Money trees are actually water chestnut trees made into Bonsaian, evergreen with lovely bright green foliage, extraordinarily hardy and traditional symbols of good luck, all of which makes them a perfect gift for others or a gift to yourself if you need a little extra positive karma. AGE: This Money Tree Bonsai is 4 years old.